If you cannot make a group larger than one or two people, then you are probably better planning to come to one of our future Open Days as you can book for a trip at your preferred time. Groups are normally from 7 to 14 people, often from other Clubs (Rotary, bowling, WI and so on) or can be private parties. There are special arrangements for Scouts who should refer to the page about arranging Scout visits for further information. 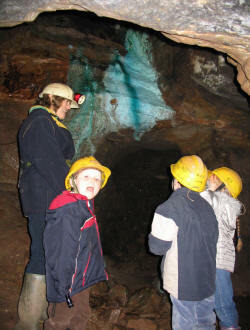 We usually take groups round Wood Mine and we have put below the general advice we give when you arrange a trip. In autumn 2018, we decided to plan one trip each month for visitors whether individual or in a group, large or small. To join one of these trips, please use the booking system provided on the trip booking page. You can also email to Group-Trips [at] Derbyscc.org.uk [subject] Group_trip_enquiry if you have a special requirement. For all other enquiries, please go to the page on Legal Issues. There is an excellent tea room behind the Wizard which serves home-made cakes, tea, coffee, etc. most days of the week and usually an ice-cream van in the car park. The Wizard (pub and restaurant) serves drinks and food - but no alcoholic drinks before the trip, please. For further information about parking, refreshments, etc., have a look at our page about the facilities on the site. All the mines except West Mine and the Scout Hole are under property owned by the National Trust and of these, Wood Mine, Brynlow Mine, Cobalt Mine, Engine Vein, the Hough Level, Doc Mine and Saddlebole Mine have been leased to the Derbyshire Caving Club. The National Trust has granted permission to the DCC to take visitors around the mines covered by the lease subject to certain conditions. Visitors are generally taken around Wood Mine and occasionally Engine Vein. 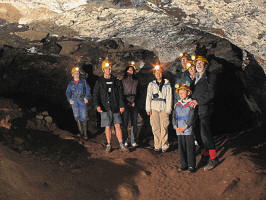 Visits to the Hough Level or Brynlow can only be made by experienced cavers. Within reason, we can adapt the type of trip to suit your needs. Most visitors want a general trip around the mine and to be told about the history and geology but not in too much detail. However, we can arrange for leaders who specialise in particular aspects of the mines if you make this clear when arranging the visit. We can also make the trips more or less "adventurous" depending upon the age and ability of the group. Some years ago, we used to organise birthday parties in the mines but with the change in legislation concerning young visitors, these are no longer generally available. Anyone normally fit and 18 years of age or older may visit the mines leased by the DCC provided that they are in a party led by a member of the DCC. Persons under 18 may do so provided an indemnity is signed by a parent or guardian or Local Education Committee. Persons under 16 must be accompanied by a parent or guardian or some other suitably authorised person, for instance a Scout Leader or Teacher. The DCC will lend a helmet and miner's cap lamp to each visitor. No other special equipment is required and visitors are discouraged from bringing extra items such as torches and cameras which may hinder their tour around the mines. Good footwear is essential and wellington boots are recommended. Waterproof clothing is not required but old clothes which will not suffer from contact with sand and mud are advisable. The temperature in the mines is cool, but constant. Dress as if for an autumn day! There are a some hazards but the parts of the mine visited have been selected to minimise risk. The guide's instructions must always be followed. The route can be varied according to the interests and abilities of the party. Visitors with medical conditions (such as asthma, angina, epilepsy, etc) must ensure that they have the appropriate medication and should advise the leader in advance. There is a page on this website about safety in caves and mines. No mineral specimens of any kind may be taken from the mines. This is a condition of the lease and also means that the minerals remain in situ for subsequent parties to see. Photographs may be taken without any restriction, but photographers are asked not to delay the rest of the party unnecessarily. Photographers must be aware of the extra risk to their equipment when taking it underground. The cost of maintaining the mines and lighting equipment is borne by the DCC so donations from visitors are expected. Donations will not be accepted from persons under 18 unless accompanied by a parent as the Club is not licensed as an Adventure Activity Centre. However, donations are expected in respect of under-18s on Open Days where the Club is demonstrating its activities. 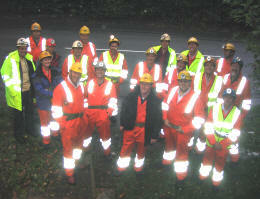 Planned visits to the mine led by volunteers are available on Tuesday nights and some other times of the week. To find out more, contact the person named below. The meeting place for such trips is at the large car park 100 meters on the Macclesfield side of The Wizard on the Macclesfield Road, Nether Alderley (SJ 8591 7729 or N53.29255, W2.221289) or at the Surgery opposite The Wizard. As an alternative to an organised trip, you can visit on Open Days which are held twice a year; for further details, follow the link. See this Google Map for the location of the Wizard.